Koreans commemorate another major event in their country yesterday, and that is Hangul Day. This is the day King Sejong officially founded Hangul, or the Korean writing system. And today, we'll join them in appreciating Hangul even more by trying out extra challenging Korean tongue twisters! To give you a brief background, Hangul (한글) is the writing system founded by King Sejong in 15th century Korea. It is also known as the Hunminjeongeum (훈민정음). This writing system is shared by North and South Korea. Hangul is also used in parts of China like the Yanbian Korean Autonomous Prefecture and Changbai Korean Autonomous County located in Jilin Province. These days, Hangul is used along with some Hanja or Chinese characters. Tongue twisters in Korean are called Jaenmalnoli (잰말놀이) or "playing with quick words". Korean tongue twisters can be a fun way to practice Korean pronunciation. 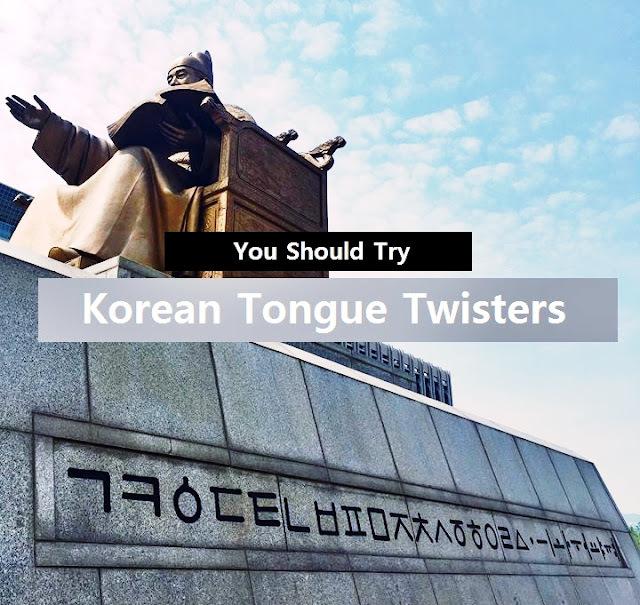 And just like we mentioned earlier, we challenge you to do these Korean tongue twisters! 네가 그린 기린 그림은 못 그린 기린 그림이고 내가 그린 기린 그림은 잘 그린 기린 그림이다. Romanization: "ne-ga geu-rin gi-rin geu-ri-meun mot geu-rin gi-rin geu-ri-mi-go nae-ga geu-rin gi-rin geu-ri-meun jal geu-rin gi-rin geu-ri-mi-da." 그리다 (geu-ri-da) meaning "to draw." Ready for the next level? Let's get it! 간장 공장 공장장은 장 공장장이고 된장 공장 공장장은 강 공장장이다. Romanization: "gan-jang gong-jang gong-jang-jang-eun jang gong-jang-jang-i-go doen-jang gong-jang gong-jang-jang-eun gang gong-jang-jang-i-da." 된장 (doen-jang) meaning soy bean paste. PS: The 장 (jang) at the end of words also means manager. Still easy? Let's get it to Level 3! Romanization: "seo-ul-teuk-byeol-si teu-keo-heo-ga-gwa heo-ga-gwa-jang heo-gwa-jang." This tongue twister translates into, “Seoul Metropolitan City’s Patent Granting Section Permission Section Chief, Chief Heo,” in English. Practice these words to pass level 3! And if you've succeeded level 3, let's see if you can pass the FINAL challenge. Let's get it! Romanization: "gyeong-chal-cheong cheol-chang-sa-reun noe-cheol-chang-sa-ri-go geom-chal-cheong cheol-chang-sa-reun ssang-cheol-chang-sa-ri-da." Here's the cheat sheet. Practice these words to pass the final challenge! 검찰청 (geom-chal-cheong) meaning prosecutor's office. It's not that easy, eh? But seeing you've come as far as this, you've done a good job. Hangul is the greatest memento of King Sejong's love for the people of Korea. Nowadays, more and more people are appreciating this wonderful writing system. Let's use it in a good way. Happy Hangul Day!